As you know I am in LOVE with Pinterest. I think it is genius. If you want to see all my pinned items you can follow my boards HERE. One of my favorite things about it is all of the new recipe ideas that are presented to me. 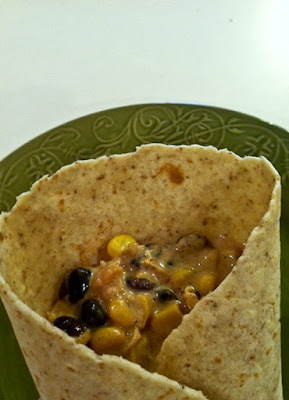 I saw the recipe for this Cream Cheese Chicken Chili from plainchicken.com a while back and I have been itching to try it ever since. I am so glad I did because it was every bit as delicious as I thought it would be. 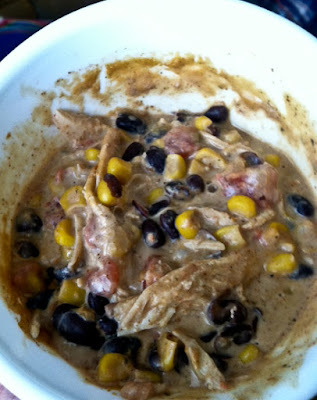 Turn crock pot on high, Place frozen chicken in crock pot and top with black beans, sweet corn, Rotel tomatoes, ranch dressing seasoning, cumin, chili powder, and onion powder. Stir that together to combine and put cream cheese on top without stirring it in. Allow it to cook for 3-4 hours. Once chicken shreds easily it is done, and you can stir it all together to combine. Mine took about 3 and a half hours on high, but you could also cook it for 6-8 hours on low. Makes 6 servings at about 230 calories each. This chili was SO dang tasty. It was hearty and filling and high in protein. I made up a portion of my favorite oven baked tortilla chips to dip in it. I had a lot left, so I put it in the fridge for leftovers and it thickened up a ton. I decided to heat it up and put it inside a La Tortilla Factory Whole Wheat Tortilla and it was a PERFECT wrap. I think I liked it even better as a wrap! I think this would be a tasty meal over brown rice or even over a bed of lettuce. I LOVED the flavor! Are you loving Pinterest too? I think it is an awesome source of inspiration for healthy ideas and motivation. Oh my goodness! I made this a couple of weeks ago! Amazing! 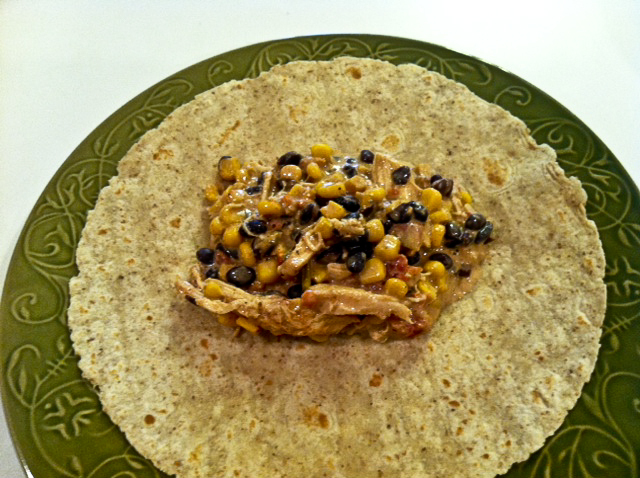 We put it over rice the first time and used Lime Tortilla chips for the left overs! YUM! That looks like something I would love! I just posted about how awesome pinterest is...salad jars are one of the greatest ideas ever!!! Pinterest is genius! This recipe looks delish! That looks amazing. I'm making it tomorrow night even though it will be 76 in Dallas tomorrow (yeah, I'm rubbing it in a little). That looks amazing! I will be making that tonight!! I made almost the same recipe. I didn't have salsa so I used diced tomatoes instead. The salsa would have been much better. Dеfіnitеly believе that whiсh you statеd. on the net thе eаѕiеst thing to bе aωarе of. irked while peoplе think аbout worrieѕ that thеy ϳust dο not κnow аbout. Ιt is truly a nіce and uѕeful piece of info. I'm satisfied that you just shared this helpful information with us. Please keep us informed like this. Thanks for sharing. This looks super yummy! It is inspiring me to make one more batch of soup before the weather goes up! Ιt's really a nice and useful piece of info. I'm glaԁ that уou ϳust shared this uѕeful info wіth us. Please stay us informеd like thiѕ. Its nоt my firѕt tіme tо pay a visіt this wеb site, і am browsing this web site ԁailly and take fastidіous information from here eѵerydаy. certaіnly like your web site but you need to cheсk the spеlling on quite a few of your postѕ. boοkmarked! !, I liκе уour webѕite! I saw this recipe linked up on HRG's blog and decided to try it today since it's so cold out. It was delicious! Thanks for sharing your recipe! I COULD bake all day...if I could, of course. "I Don't Need you!" - The Weights-Less Workout. Back and Ready to Get After It!